Known to be one of the most sought-after beach resort destinations of Thailand, Pattaya attracts a huge number of beach lovers. This tranquil destination is rustic but surely appeals a number of visitors with an array of fun activities, fascinating nightlife, lavish accommodation and charming natural locations. Right from mesmerizing sea beaches, a wide selection of restaurant & markets (serving delicious seafood), theme parks, water sports, massage parlors, shopping streets, museums and much more, this city gives you many reasons to pay a visit. However, if you are planning your first visit to this vibrant city read on and knows more about the must-visit attractions of Pattaya. If you are in Pattaya, you can’t afford to miss the world-famous “Tiffany’s Cabaret Show” which is a 30-year-old ladyboy cabaret extravaganza. The show is of 1-hour duration that will truly keep you thrilled with the riot of sound, colour and light ensues. The show includes entire hemisphere through song, dance or skit, including the scenes from a Bollywood musical take on the Indian Raj, homage to China’s Imperial past and progress, a traditional Korean fan dance, Siam’s history told through graceful Thai dance, slapstick burlesque and Broadway show tunes, all performed was gracefully dressed up ladyboys. One-of-its-kind architectural marvel, the Sanctuary of Truth is made entirely of wood and commanding a celestial view of the ocean. In fact, this magnificent wood architecture is a famous religious shrine and has a huge cultural significance. It is constructed in four winds, dedicated to Thai, Chinese, Khmer and Indian religious iconography. Portraying a unique fusion of religion, art, philosophy and culture, this monument is neither a temple nor a palace, however, looks like an eye-catchy amalgamation of both. This unique rather exotic monument personified the “Ancient Knowledge’, “Ancient Vision of Earth’, and “Eastern Philosophy’. Sprawling over an area of 100,000 square kilometers, the Four Regions Floating Market are categorized into four sections- each selling and representing items from the four major parts of Thailand (north, central, northeast and south). In this huge market, one can find many eateries, souvenir shops, fruit stalls, and some art galleries. There is also a cultural show organized every afternoon. The market has 350 million, but market over 114 shops and water vendors selling traditional Thai food, desserts and specialties from all over the kingdom. In order to experience a true floating market experience, one must hire a man-powered boat and get around and explore the richness of the surrounding Thai architecture and riverside life. Offering around the world tour experience in 2 hours, Mini Siam is one-of-its-kind amusement parks in the world. 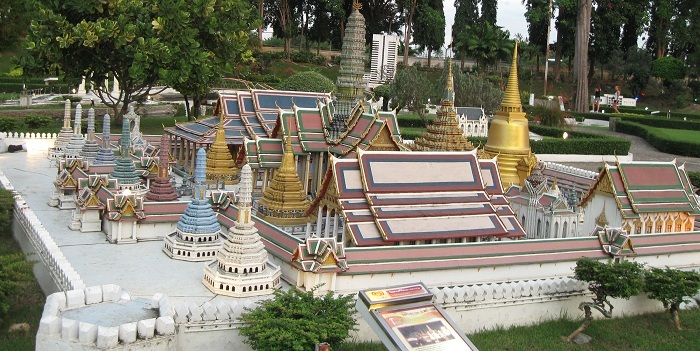 Being Thailand’s one of the most popular attractions, this magnificent park features around a hundred replicas of famous sites worldwide – from the Statue of Liberty to the Temple of the Emerald Buddha display at a scale of 1 to 25. Established in 1985 as a part of a research project, Mini Siam’s 46,400-sqm area is divided into two different zones, namely Mini Siam and Mini Europe (which is, in reality, the rest of the world), separated by a small serpentine river that you can just step across. A visit to this joyful amusement park will surely make your holiday worthwhile. Apart from these, Ripley’s museum (South Pattaya), Pattaya Elephant Village (South Pattaya), Underwater World Pattaya (Jomtien), Pattaya Tiger Zoo (Bang Lamung), Nong Nooch Tropical Garden (Jomtien) and ViharnraSien (Sattahip) are some of the other popular attractions of Pattaya. Log on to Namaste India Trip for exciting holiday packages to Pattaya and different destination of Thailand.